One is writing this from one's garden facing room at Karuna Niwas on Moti Doongri Road in Jaipur. Jaipur is located 270 km. away from Delhi. Several species of birds inhabit Jaipur, which is a five hours drive from Delhi. It's Holi and where else to enjoy it other than the colourful state of Rajasthan. Boarding the Aravalli Express at Ahmedabad, I land at Jaipur Station at 8 p.m. and am escorted by my gracious Rajasthani host Mr. Ajit Singh Rathore, to drive down to Karuna Niwas Heritage Homestay, located 10 km. away. A relaxing hot water shower in my luxurious suite at 9 p.m. was a rejuvenating experience for my immune system. Holi is a festival which is celebrated in Rajasthan with great fervour and a trek through the sanddunes of Rajasthan in the end of March is the ideal way to absorb the energy of the primordial elements. 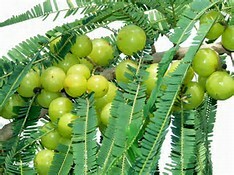 Meditating at the garden of Karuna Niwas, under an amla (Indian gooseberry) tree, while watching hundreds of stars twinkling in the sky, is a once in a lifetime experience. As one wakes up at dawn and watches the darkness disappear, while listening to the sweet songs emanating from the beaks of innumerable mynahs, ring necked pigeons and tiny sparrows who have sought sanctuary under the huge trees that surround this picturesque homestay. Within 60 minutes of starting the heritage walk, one reaches the main gate to enter the City Palace. Karuna Niwas is located a 1.5 km. away from Sanganeri Gate, Hawa Mahal, City Palace and Jantar Mantar. The most unique advantage of staying at Karuna Niwas is to be able to do a heritage walk from Sanganeri Gate to Jantar Mantar and back. Rajasthan is as colourful as its Holi celebrations and turbans. The 1.5 kilometres walk from Sanganeri Gate to Jantar Mantar gives you a chance to explore the sounds and sights of the walled city of Jaipur. It is advisable to stay at Jaipur for at least three nights if not more to explore the palaces in and around Jaipur which abound in this pink city. After a leisurely breakfast of baked alu parathas at Karuna Niwas, one leisurely ambles across to the main road to board a shared electric auto, which drops me off at Sanganaeri Gate for Rs. 10/. The co-passengers are a vital source of information about the heritage structures around Sanganeri Gate. One finds a 100 year old Banyan tree in front of the Police Commissioner's Office, a stone's throw away from Sanganeri Gate. Having visited many of the world's oldest trees in 11 countries around the world, I take the opportunity to soak the energy aura of this giant tree. The Police Commissioner's office itself is located in an ancient haveli. Within 60 minutes of starting the heritage walk, one reaches the main gate to enter the City Palace. After getting down at Sanganeri Gate, one walks towards Hawa Mahal, Jantar Mantar and City Palace. The first thing that strikes you during this heritage walk, are the pink heritage havelis, terraces, fortresses, gates and temples that line up both sides of the street. A plethora of vibrant colours are seen during this walk. But the first structure no one can miss is the Hawa Mahal. Hawa Mahal Palace is so named because it was essentially a high screen wall built so that the women of the royal household could observe street festivals while remaining unseen from the outside. 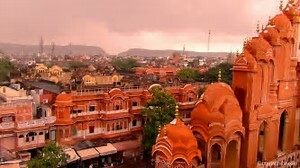 Hawa Mahal is popularly referred to as "Palace of the Winds". Standing 5 stories high, but only 1 room deep, the structure was designed for the royal ladies to view daily street life below, unnoticed. Situated in the hectic Johari Bazaar, near the Badi Chaupad (the big square), it is a reminder of a bygone era and transports one to the good old days, when India was ruled by the Royals. 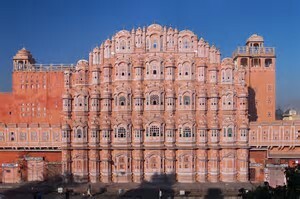 It is estimated by researchers that even the most modern scientific construction companies cannot construct "Hawa Mahal" today, inspite of computer aided design! Hawa Mahal was constructed in 1799 by Sawai Pratap Singh (grandson of Maharaja Sawai Jai Singh who built Jaipur), constructed Hawa Mahal as a continuation of the Royal City Palace. It was built so that the princesses and queens could see the Holy processions through the honeycoomb shaped lattice windows, ensuring that they were screened from outside eyes, would feel cool and comfortable in the evning breeze and could watch the street festivities from their royal perch. After crossing Hawa Mahal one walks towards the gates of the "City Palace" and finds another imposing structure in pink sandstone. One is informed that it is a haveli enroute to the entrance of "City Palace." One takes a short break after the long heritage walk, cools off with some papaya juice, before exploring the Indian street food cuisine, available at Jaipur. My host Mr. Ajit Singh Rathore who is a living encyclopedia of Rajput history, informed me that the present Maharaja of Karauli, HH Maharaja Shri Krishan Chandra Pal Deo Bahadur Yadakul Chandra Bhal stayed at Karuna Niwas for 10 years between 1970 and 1980. Visitors traveling by road have to drive from Delhi to Jaipur which is approximately 270 km. Jaipur is well connected by road from Delhi, Jodhpur, Ajmer, Udaipur, Mount Abu and Ahmedabad. The nearest international airport to reach Jaipur is at New Delhi. Jaipur is a 6 hour drive from New Delhi. Jaipur is connected to Mumbai, Delhi, Chennai, Kolkata and Bangalore by flights. Jaipur is connected to most Indian cities by trains. Chefs Bhawar Singhji and Roma will rustle up delicious meals on request at Karuna Niwas. While Bhawar Singh specialises in Rajasthani cuisine, Roma is an expert in Bengali dishes. Lots of small restaurants serving Rajasthani vegetarian cuisine dot Jaipur. Freshly steamed vegetables with spices, cooked in turmeric gravy, with hot freshly baked rotis are available at most roadside dhabas. The food at the high profile hotels is only for the gastronomically adventurous who like greasy food. Vegans can opt for fresh tropical fruits including water-melons, papayas, tender coconuts and pineapples which are available at the local market. Karuna Niwas offers baked alu parathas, gobi parathas and mooli parathas for breakfast. Every good thing must come to an end and I bid farewell to the delightful place which had been my home for the last three days, as I return to Ahmedabad via Ajmer. Goa is a paradise for all those who love the sun, the sea, the sand and the surf. Laguna Anjuna is a short walk away from Anjuna beach, one of the many beaches that dot the coastal highway from Goa to Kerala.